Cetaphil is the No. 1 dermatological skincare brand in Singapore, especially for the sensitive skin. The iconic Cetaphil Gentle Skin Cleanser was founded by a pharmacist in 1947 and was the first skincare product formulated by dermatologists as a stand-alone skin care product gentle enough for all skin types. 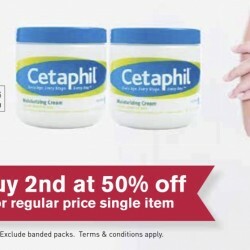 Get Cetaphil at Guardian now with their promotion of Buy 2nd item at 50% off for regular-price single item! Valid till 14 October 2015, while stocks last.